Big Fig Mattress Review - Supportive Enough For Heavy People? 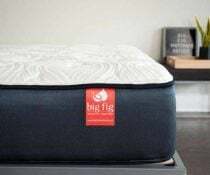 Home » Big Fig Mattress Review – Supportive Enough For Heavy People? Big Fig Mattress Review – Supportive Enough For Heavy People? If you are a larger person like me, you may have trouble finding the right mattress. You want to make sure you get enough support, and you don’t want to leave big indentations in your mattress. If this is your situation, you might want to take a look at the Big Fig mattress. It is manufactured specifically for heavier people. 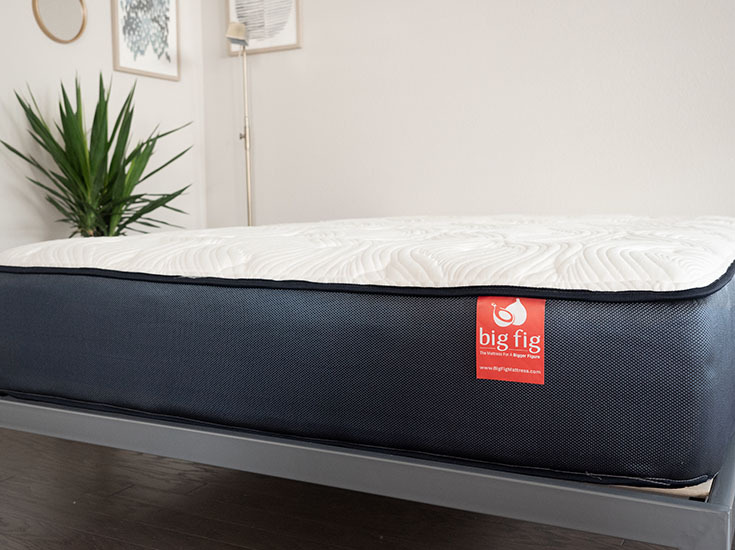 Is Big Fig the heavier sleeper mattress you have been looking for? Read on for my full review. You are a larger person. This mattress is designed with heavier people in mind. It is meant to be supportive for people up to 500 lb and features very durable foams that shouldn’t sag. You are a heavier back or stomach sleeper. A major issue for large people is finding the proper support on their mattress. If you are heavier, Big Fig should have no problem giving you the support you need when you are on your back or stomach. You are a hot sleeper. The gel latex foam has holes in it to allow for airflow. In addition, the coils should promote airflow. Overall, you shouldn’t be sleeping hot on this mattress. You are a lighter person. Again, this mattress is made for heavier people. If you are lighter, this mattress will feel very firm to you. It will be supportive, but it may be too firm overall if you aren’t a large person. You are a side sleeper. Even if you are heavier, this is a firmer mattress. It seems more focused on support than pressure relief. A part of it may have been that I am only 230 lb and not heavy enough to really activate the top layers. You want a memory foam feel. This is a firmer mattress. While it does incorporate foam in its construction, it does not let you slowly “sink” into the mattress like classic memory foam does. If you prefer that quicksand feeling, this might not be the mattress for you. The cover is quilted with 1” of ThermoGel foam. It is tufted as well. The first layer is ½” of a gel-infused latex foam. Next there are three 1” layers of polyfoam. This is followed by 7” of individually wrapped coils. The base is 1.5” of high-density polyfoam. The foams in this mattress are CertiPUR-US® certified, meaning they are more eco-friendly than traditional mattress materials. The Big Fig is made in the USA. The Big Fig is available in Twin, Twin XL, Full, Queen, King, and California King. The gel-infused latex foam is perforated to promote airflow. The ThermoGel is also designed to dissipate heat, and the coils allow for airflow as well. You shouldn’t be sleeping hot on this mattress. 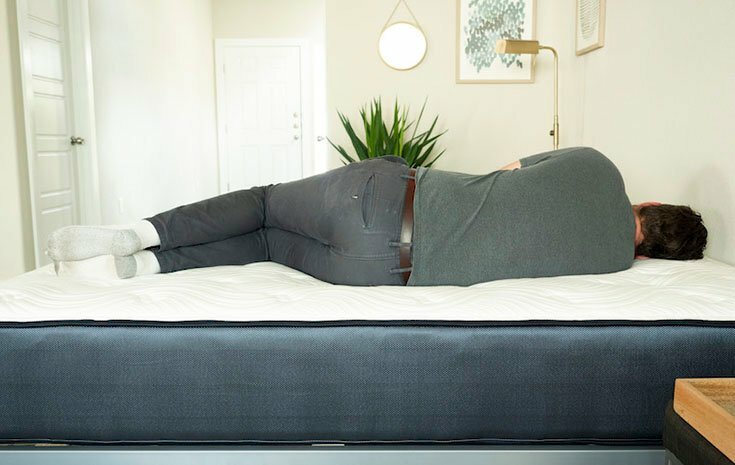 This mattress is designed to be supportive enough for heavier people. The foams are high-density, and there are 50 percent more coils in the coil layer than those usually found on a hybrid mattress. The Big Fig also addresses the issue of sagging. Heavier people shouldn’t leave an indentation as they often can on conventional hybrid or foam mattresses. The high-density foams are designed not to sag. All of the high-density, supportive materials should make this a durable mattress. This could be a good long-term investment. Each mattress comes with a supportive Big Fig foundation that is designed to handle up to 2,000 lb. For me, this mattress felt like an 8/10 on a firmness scale, or firmer than average. However, I am only 230 lb and this mattress can handle two 500-lb sleepers. So, if you are in the 300 to 500 lb range, you will activate the top layers more than I did and might find this mattress to be softer.On my back, I think I was actually too light for this mattress. The mattress was too firm for my hips to sink in and keep my spine in proper alignment. Likewise, I feel the mattress is too firm when I am on my side. I do get some pressure relief from that pillow-top layer, but I believe I could use a softer mattress. However, on my stomach, I feel very well supported. I often have trouble finding the support I need on my stomach. When I am in this position, I am not bowing in at the hips at all. In terms of feel, the mattress has a balanced hybrid feel. The top layers are responsive with some bounce, so it is quite easy to move around on the Big Fig. Again, people larger than me may have a different experience. Overall, I thought the Big Fig handled motion transfer quite well. During my tests, the glass was disturbed only a little bit. When I pressed into the mattress or rolled around, the glass did not move much. Memory foam is usually good at cutting down on motion transfer, and the Big Fig has multiple layers of foam on top. I would say this is a good mattress for heavier couples. The Big Fig features a foam encasement to help with edge support. Because of this, it barely compresses when I am sitting near the edge. I feel very secure in this position. When I’m lying down, I feel like I can lie very close to the edge without rolling off. As a larger person, I am glad to be able to use the whole mattress and really stretch out. You can see the great edge support in the photo below. It is a great choice for heavier people. The Big Fig does what it says it will do. It is extra supportive and shouldn’t sag. Larger people could be very happy with this mattress. It does a great job of sleeping cool. The perforated, gel-infused latex and the coils promote airflow in this mattress. In addition, the ThermoGel should keep you cool at night. This should be a long-lasting mattress. The materials in the Big Fig are meant to stop sagging and give larger people the support they need. Because of this, the components are very durable and should make this a good long-term investment. The Big Fig is successful at handling the issues many heavier people deal with. It is extra supportive and shouldn’t sag under larger weights. Heavier back and stomach sleepers should find the support they need. However, if you are under 300 lb, the Big Fig may feel firmer to you. This is just something to note. If you are even lighter, you may wish to look elsewhere. The Big Fig comes with a foundation that is meant to support heavier weights. Each mattress comes with free shipping and a 20-year warranty. Maybe try the Helix Nightfall then.